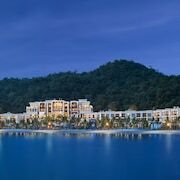 This is a great hotel with the best private beach in Langkawi. 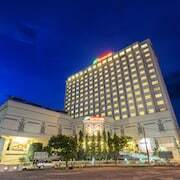 The location is close to everything in Langkawi however you feel miles away from anywhere with the jungle and rice padi fields surroundings. Langkawi was amazing and this place topped it off. While we were in Langkawi we visited the cable car, eagle square, Pantai Cenang, and Cenang Mall. 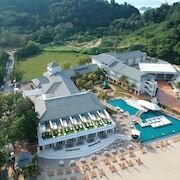 From above, Langkawi is a patchwork of emerald tree fronds, crystal water, and red roof tops. Up close, this archipelago of 99 Malaysian islands is just as impressive and vibrant. Snorkel the waters just off shore, ride a cable car to the top of Gunung Mat Cincang, and walk through Eagle Square. Make sure you stop and marvel at the namesake monument, an Eagle sculpture with a 12-metre tail. Rainforest treks, half-day cycling tours, and quiet reflection at the Telaga Tujuh freshwater rock pools also make for wonderful items on your itinerary. 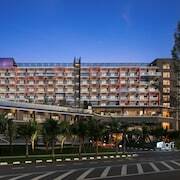 Langkawi accommodation caters to your every need, from comfortable rooms to spectacular swimming pools, so you’ll always have a home away from home to return to after a day of exploration. 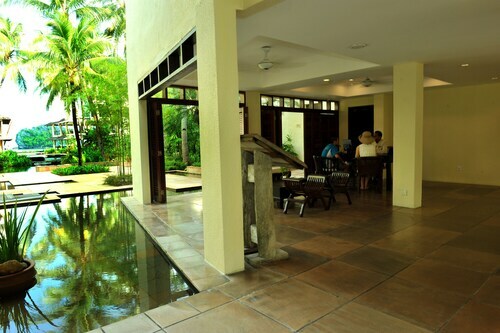 Lodging on the islands ranges in price and style. Stay in luxury at one of the top Langkawi resorts, or treat yourself to a reservation at an over-water bungalow to enjoy easy access to the sea. When you wake up every morning at a Langkawi beach hotel, your worries will feel far away—and they are. Temperatures in Langkawi remain nearly the same almost all year-round. You might sweat a bit during the day, as the highs fall around 32 degrees, but evenings cool off to a comfortable 24 degrees. Precipitation, on the other hand, varies quite a bit by month. Langkawi is rainiest between September and October, and the dries season falls from mid-November through March. Once you arrive in the islands, transportation by car, bus, and motorbike is all at your disposal. Expedia.co.nz has the best deals on holidays to the islands of Malaysia. 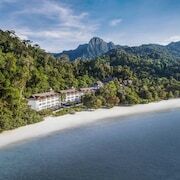 From booking your flight to car rentals in Langkawi, we have tracked down the lowest prices so you don’t have to. Your adventure in Langkawi starts right here! Explore Langkawi with Expedia.co.nz’s Travel Guides to find the best flights, cars, holiday packages and more!